Osteitis Pubis has become a common condition in Australian Rules Football Players. 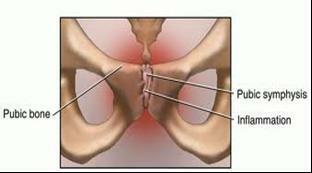 It is a condition characterized by oedema of the bone marrow within the pubic rami. This can be confirmed with MRI and is usually a unilateral condition, but may be bilateral in some players. The player presents with groin pain aggravated by running and kicking activities. Treatment of the adductor muscles does not improve the condition. Any rotational activity can aggravate the pain, so often the player decreases running activities and increases cycling activities to maintain fitness, believing that the non-weight bearing cycling may be less painful. However, cycling, although less aggravating than running, still increases pain and the player comes in to be assessed. Resting for a few weeks can also settle the pain, but upon return to sport, the pain returns immediately. Physical assessment reveals a positive squeeze test (the player strongly squeezes their legs against your closed fist which is positioned between their knees) which is the clinical test for osteitis pubis. Tight rectus abdominis and tight and weak adductor muscles in the leg are nearly always present. These two muscle groups through their attachments onto the pubic ramus cause great strain to occur as the running (rotational) activities impart strong forces onto the pubic bone. These forces result in oedema (swelling) forming within the pubic ramus, and being an enclosed space, the oedema increases pressure and causes pain. Weak gluteus medius and poor core strength (mainly transversus abdominis) are major contributors to the development of this condition, as is limited hip rotation (usually internal). Conservative management is usually the first plan of attack if the condition is not too severe. The player rests from all weight bearing rotational activities until the squeeze test is negative, and meanwhile the physiotherapist commences a program of stretching tight muscles, releasing overactive muscles, strengthening weak muscles, and biomechanical correction to enable the athlete to return to sport. Return to sport must be closely monitored with weight bearing rotational activities introduced slowly and carefully. SURGERY OPTIONS Current surgical options involve drilling small holes into the pubic ramus to release pressure from the swollen bone marrow. Sometimes, a conjoint tendon repair is performed simultaneously to strengthen the whole anterior groin area. Post-surgical rehabilitation mirrors that of conservative management and should be closely monitored by a physiotherapist.